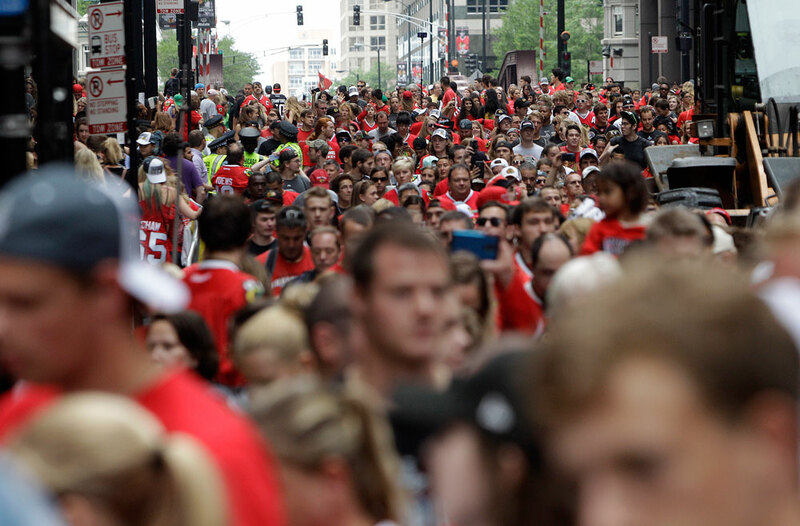 Chicago Blackhawks fans pack downtown streets after the Blackhawks players rode on double-decker buses in a parade to celebrate the NHL hockey club's Stanley Cup championship,Thursday, June 18, 2015, in Chicago. 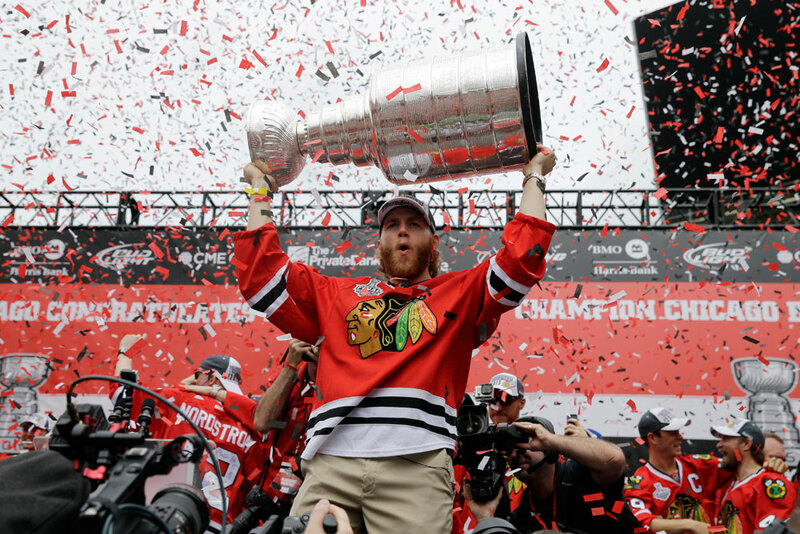 Thousands of fans turned out Thursday to cheer the Chicago Blackhawks as they celebrated their third Stanley Cup championship in the past six years with a downtown parade and a rally at Soldier Field. Goalie Corey Crawford told the fans "you guys made this unbelievable." Duncan Keith, the defenseman who won the Conn Smythe trophy as the playoffs MVP, hinted at another win saying, "four sounds better than three." Earlier, the crowd cheered for Blackhawks legends Bobby Hull, Denis Savard and Tony Esposito. Former Blackhawks star Stan Mikita, who suffers from a progressive brain disorder, wasn&apos;t left out. "Stan ... we&apos;re thinking of you," the announcer said. The Blackhawks captured their third championship with their victory over Tampa Bay in Game 6 of the Stanley Cup at the United Center on Monday night, and they haven&apos;t stopped celebrating since. The Cup has been spotted all over town, at restaurants and nightclubs. It made an appearance at Wrigley Field on Tuesday, with Cubs manager Joe Maddon hoisting it above his head and Blackhawks captain Jonathan Toews throwing out the ceremonial first pitch. On Wednesday, President Barack Obama called coach Joel Quenneville, Toews and chairman Rocky Wirtz to congratulate the Blackhawks and added that he looks forward to hosting the team again at the White House. And on Thursday, the team and the city let loose once again. Players, coaches and team executives rode to the rally in double-decker buses, passing screaming fans of all ages decked out in red and black, as they wound their way from the United Center downtown to Michigan Avenue and the rally at Soldier Field. It was a familiar scene for this Original Six franchise, and another reminder just how far it has come in recent seasons, with Toews and Patrick Kane leading the way. The Blackhawks won it all in 2010, ending a 49-year championship drought, and captured the Cup again in 2013. But this year&apos;s run was different. The Blackhawks endured, the suicide of their longtime equipment manager, the death of former teammate Steve Montador and a Kane&apos;s broken collarbone. Yet there they were on Thursday, celebrating the franchise&apos;s sixth championship. Chicago is the first NHL team to win three titles in a six-year span since Detroit in 1997, 1998 and 2002. It&apos;s hard to believe that this organization was little more than an afterthought in Chicago or that the "Madhouse on Madison" felt more like a library, with sparse crowds at the United Center. The late Bill Wirtz refused to televise home games and drove away franchise icons such as Hull and Mikita. Those two now have statues outside the arena, and the Blackhawks have a vice-like grip on the city.